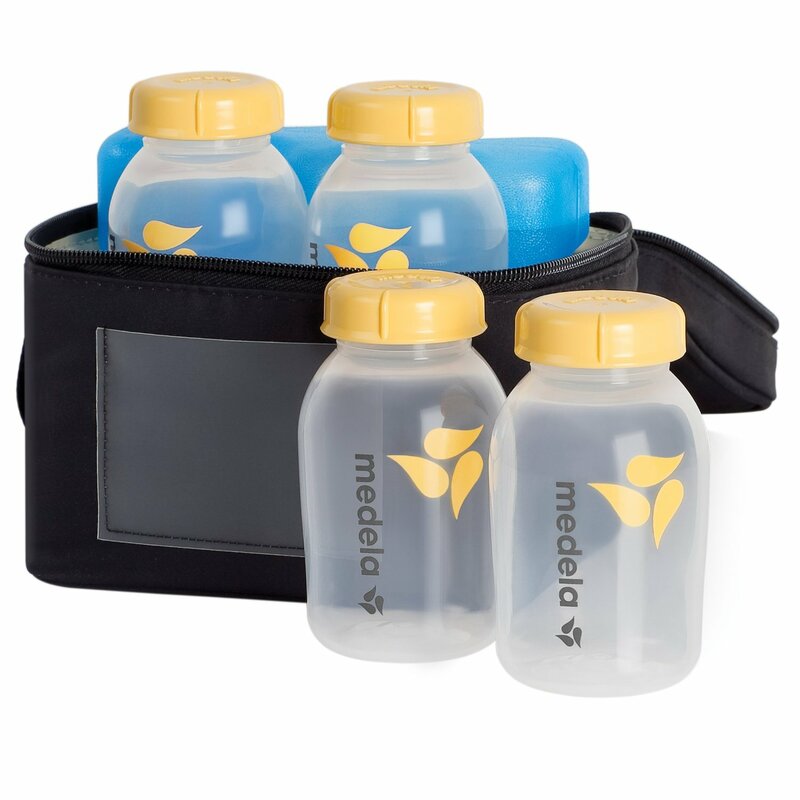 Medela Breastmilk Cooler Set is ideal as optional compartment to transport breast milk from work to home or leave with childcare. This set contains four 5 oz BPA FREE bottles for storing and nourishing, a four-bag cooler and a contoured ice pack that makes sure that your breast milk stays fresh for your baby even while you are on a trip. The cooler's bottles are airtight and spill-proof. The four containers incorporated into the set are made with safe BPA free plastic for cooler and fridge stockpiling and they are additionally dishwasher and microwave safe. The cooler set is easy to clean and store. Ice pack keeps breast milk fresh for up to 12 hours. The contoured shape allows all the bottles to fit around in the bag easily. Medela Breastmilk Cooler Set is made of same top notch material as found in Medela Freestyle pump or Medela Pump in Style advanced double electric breast pumps. Compatible with the bottles provided with the Swing and Harmony breast pumps. Even though Medela Breastmilk Cooler Set is a very simple product but still it is very useful. It will help you to store milk for 12 hours and you can carry it when you go on an outing with your baby. Since this useful little cooler includes 4 bottles and lids, a re-usable ice pack, in addition to the cooler, it is a very convenient set. The contoured ice packs snuggly fit the bottles and maintains the freshness of milk till such time you can refrigerate or freeze it. Medela Breastmilk Cooler Set is bit costly but recommended and hence can be bought by moms who are returning to work. This cooler has made my life easier for pumping at work. I can pump and store my milk at work. When I get back home the milk is still fresh and cool. The bottles are made of BPA free plastic and can be used with my Medela PISA. Best investment after my Medela pump in style!